One of my favorite times to decorate my home is fall. Notice I didn't say holiday because fall last thru three months and not necessarily for a specific holiday. I use to deck my home out for each and every holiday when my boys where little. If there was a holiday... chances are I decorated for it. I no longer decorate as big or for as many holidays. I still have many of those decorations and hope to one day pass the memorable ones down to each of the boys homes. Heck I may be wasting my time and my daughter in law and future daughter in laws might think they're ugly, but I think they boys will be glad! My sister and I got together this past weekend to make a fun halloween wreath and today I want to share it with you guys. It was super easy and can be completed in one afternoon. 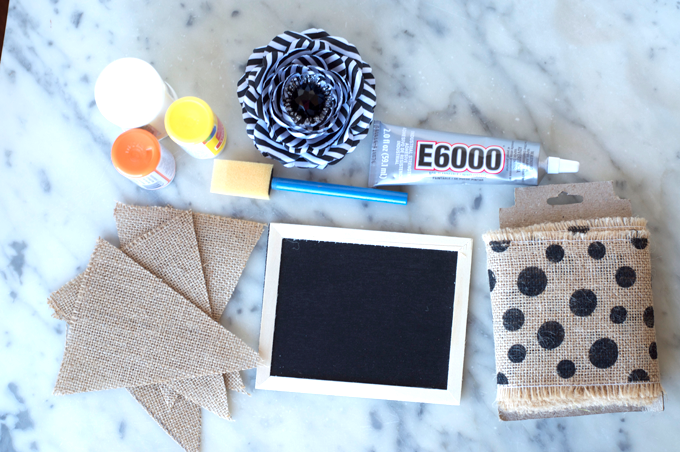 If you remember back in February I shared this DIY post for Valentines Day, and again in July this 4th of July DIY post. Pretty much the same concept just a different shape and color! So lets get started. 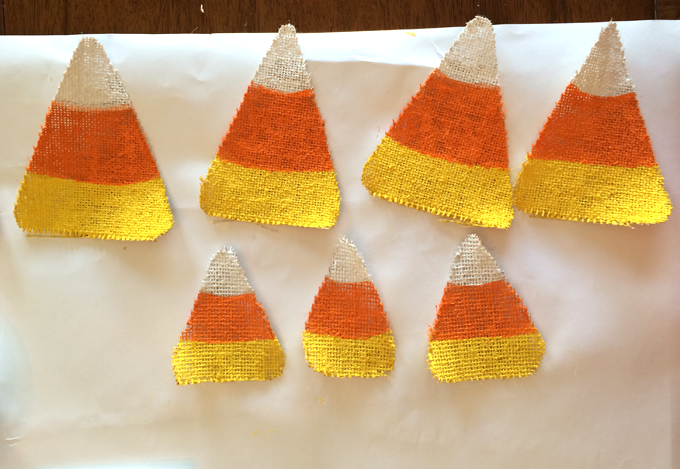 Cut your candy shapes out of your burlap. 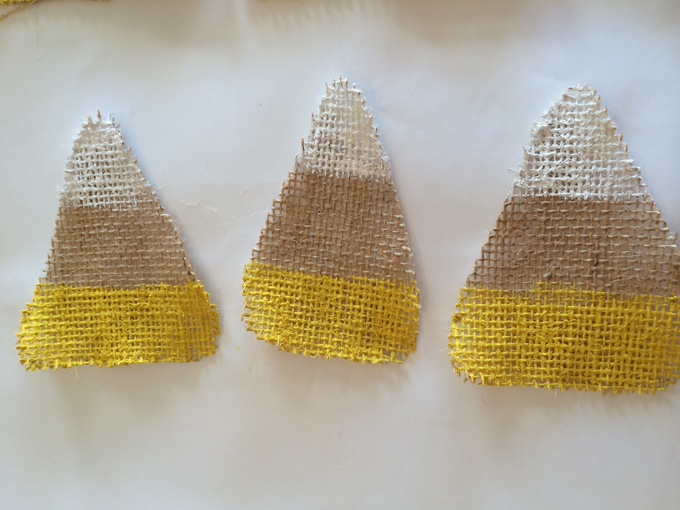 If you are working with burlap yardage or pre cut pennants you will need to cut it into candy corn shapes. Rather simple... just cut a pennant then round the corners! We cut two different sizes to vary on the wreath. 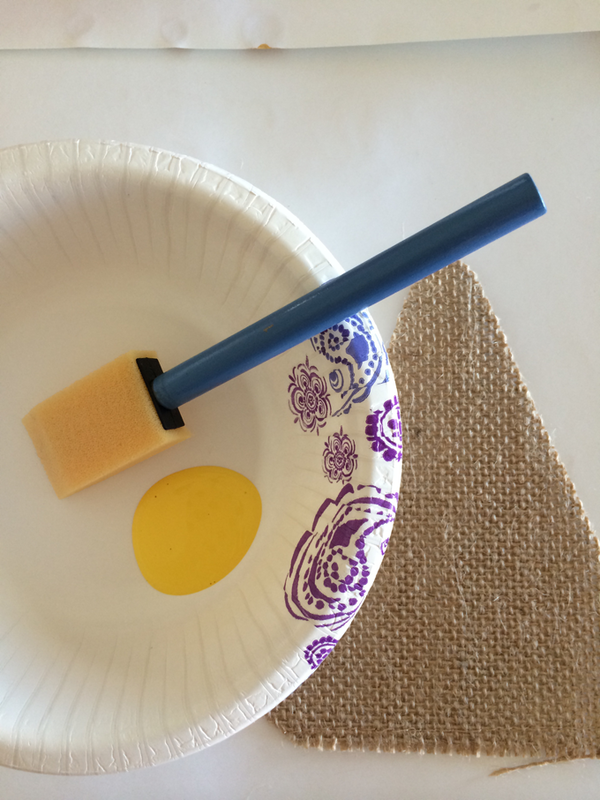 Once you have your candy shapes cut you will paint the candy shape in equal thirds each color. I started with the yellow, then painted the white, then last added the orange. Once they were all painted I went back over with the yellow to give a slight curve to the edges. I didn't want straight color lines rather I wanted them to look like they slightly bleed together. 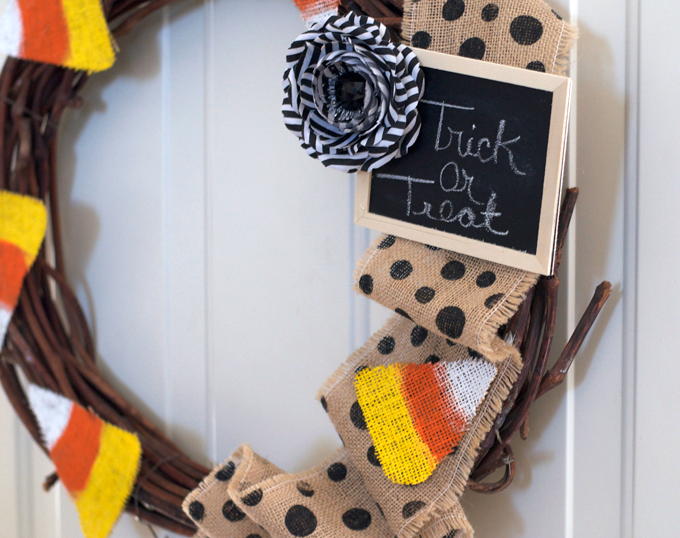 While your candy is drying add your ribbon and decoration to your wreath keeping in mind where your candy will go. I glued this pre made flower clip onto the edge of my chalkboard for a cute look and attached it to my wreath. 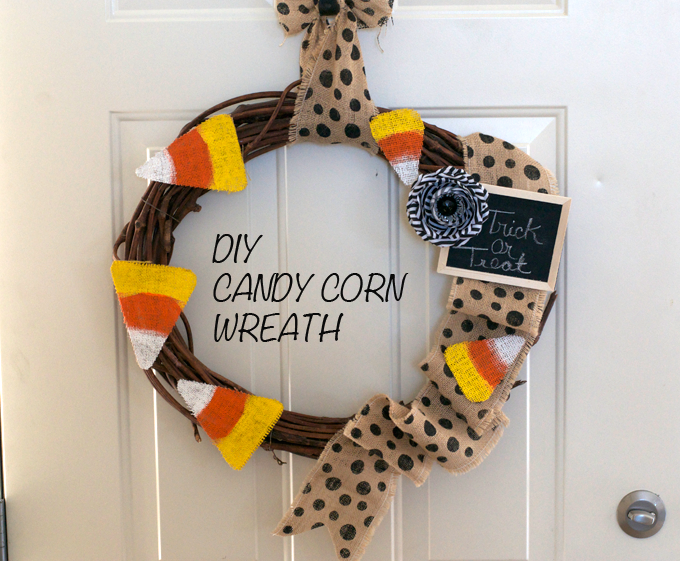 Once all my candy was dry, I glued them to my wreath and all that was left was my message on my chalkboard. I wanted to write on my board with a silver sharpie rather than chalk but wouldn't you know it... I have every single color and size of sharpies but silver. So for now I used chalk. What have you made lately? I told my sis I need to come up with an idea for Christmas since I have made something burlap for so many other holidays! Do you have any ideas? That turned out too cute!! 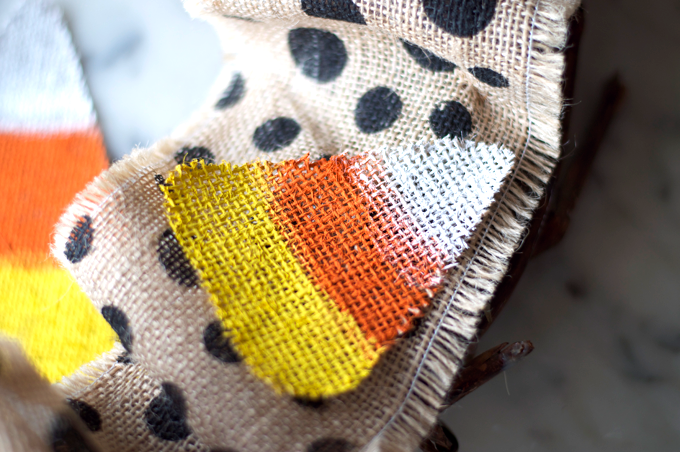 with the extra burlap you could do holly berries, santas, or stockings for little bunting like your candy corn :) cute cute lady!